Happy Friday everyone!! It seems like we can all agree that this week was LONG!!! I'm looking forward to this weekend for a few reasons, but the main one is going to another wedding!! I don't think it's any surprise that I'm a fan of weddings! 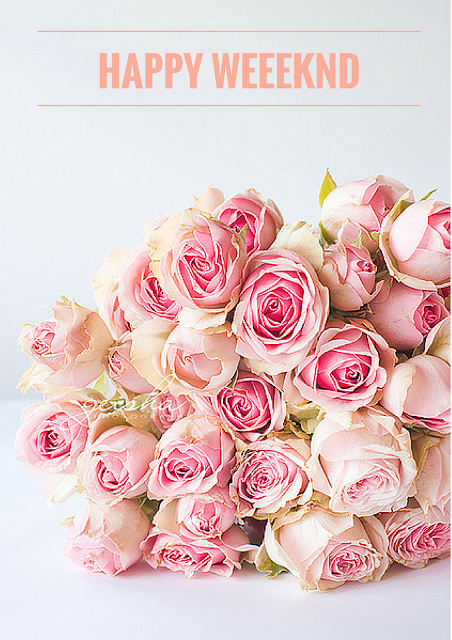 Linking up with Amanda and April to share some favorites from this never ending week! I've been in a pasta kind of mood recently! Maybe it's because we rarely eat the real thing usually opting for spaghetti squash instead, but I'm thinking a "treat yo' self" meal might need to happen soon! 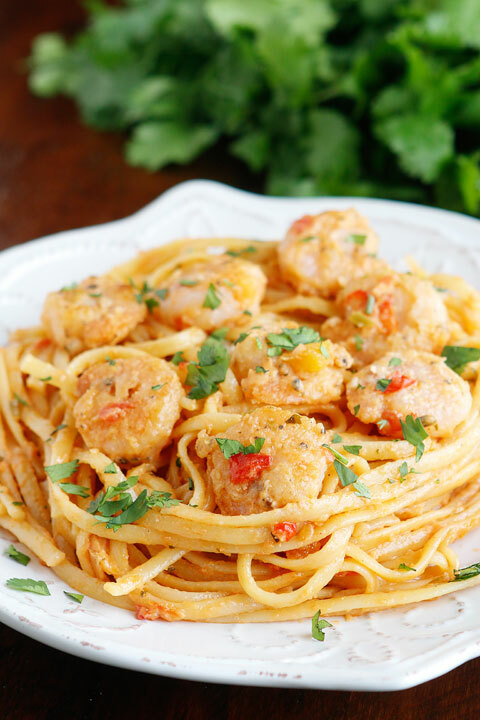 Caribbean Shrimp Pasta - yes please! I have the Ellie Goulding station on Pandora for introducing me to this song - I'm literally obsessed and listen to it on repeat! Zella Day's voice is hauntingly beautiful! I'm all about shirt dresses right now and even wrote about my love affair here, but I can't get this floral shirt dress out of my head!! It's got everything I'm loving this season! Thank you Bravo for creating a show that is not in the reality category that my husband doesn't give me the side eye for watching!! If you have time this weekend - catch up on the first episode -you'll be happy you did! Every single line of this show is a winner! || Choosing the right veil for your wedding day - all the pro's and con's to each || 9 Organizational tips to tackle your never ending to-do list || Have you seen Lauren Conrad's home - forget it just look at her closet || Cozy date night with Lauren Scruggs & Jason Kennedy at their super cute home Hope you all have a wonderful end to your week and I'll see you back here Monday for Weekending! It is wedding season! Luckily I get the weekend off from weddings :) And loving that recipe, it sounds amazing! Although I've been going for the full on carbs of pasta lol! And that dress is SO pretty! LC's home is amazing, I am so jealous. Kristen Cavallari posted her home this week too and between both of them I'm wondering why I wasn't on a reality tv show in high school haha! Happy Friday love! That recipe looks delicious, lady! And I love that dress, so so so pretty and unique. I just can't with LC's closet, that's just insane. Some girls have all the closet luck ;)! MMMmmm the caribbean shrimp pasta looks SO good! I haven't seen Odd Mom Out--I wasn't sure about it, but now I might have to watch it this weekend since you gave it such glowing reviews! I kind of love Lauren Scruggs and Jason Kennedy. They are freaking adorable!! We looove pasta, so I try to cook smaller portions and buy vegetable or whole-grain versions more often. I like the Barilla and Ronzoni colored pastas that are made from vegetables. I know they aren't a good source of vegetables on their own, but I think they are still better than eating too much regular pasta. you always post the best room/house inspirations. i think you've missed your calling as an interior decorator!! I love Lauren Conrad and her house is so gorgeous! Have fun at the wedding this weekend. I love Elli Goulding, so checking out that song now! I need that dress! Since I am losing all this weight, I need new clothes. Wedding Season!!! Haha! I will have to check out the show sounds funny! I was just reading about that show on Pam's blog - if both of you are fans, I definitely need to check that out! Also bookmarking that organization post to read later...lately my to-do list just seems to keep multiplying! Yayyyy for wedding season! I didn't catch the Odd Mom Out show, but I saw the advertisements during RHOC. It looks good, and yet another show I'll get sucked into lol. I'm alwayyyyyys in a pasta mood! This week has been SO LONG!! That pasta looks delish!!! Enjoy the wedding! Can't wait to see you rock a killer outfit!! That dish looks phenomenal. Ugh, why is pasta so not amazing for our figures? Oh man, that shrimp pasta looks so good! And I love that floral dress! Happy weekend!! MMM. i've been craving shrimp! And how did I not know about that new show? I'm obsessed with Bravo!! Have a great wknd and enjoy the wedding! I miss the wedding season. So many weddings for you! Have a great time and a great weekend!! Thanks so much for including me, lady!! Always love your posts! Happy Friday! It's definitely wedding season. All of your recipes always looks so delicious! Definitely have a treat yo self meal :) Have a great time at the wedding! definitely need to check out that show. um LC's home is gorgeous! i want it all. Never heard of Odd Mom Out but I might just have to add it to my list of recorded shows....the Caribbean shrimp pasta looks delish and it's definitely worth treating yourself once in a while. We also hardly ever eat pasta anymore but on the weekends we "cheat". Have fun at the wedding and happy weekend lovely lady! I have a wedding this weekend too! Tis the season. Mmm that recipe sounds amazing. I have been on a major shrimp kick lately and am probably going to have to have some today now, thank you. I hope you have an amazing weekend! Yay for weddings! I so need to check out LC's home, I'm sure it's amazing. Love that dress, so fab. Have a great weekend. Obsessed with that floral shift dress!! Too cute! We have a wedding this weekend, too. they are so much fun! So glad it's the morning and I love these shares! Can I just be Lauren Conrad please?! That shirtdress is precious! I started watching Odd Mom Out but need to finish it. It seemed pretty cute so far! If anything it'll get my husband off my back about watching "mindless tv" like Real Housewives! I opt for Spaghetti Squash too - but That Pasta dish sounds AMAZING! Especially if you could grill the shrimp a little first! Charles Henry makes the best shirt dresses! I was actually planning on picking one up for a shower I have in a couple of weeks :) And we also have a wedding this weekend - tis the season! Have fun and happy Friday! Happy Friday!! I've seen the ads for that show but did not catch the first episode. My husband will also love it if I become addicted to yet another show on Bravo, lol. That pasta looks delicious! Adding that song to my Spotify list right now! I really liked Odd Mom Out too - it was cute! Have a great time at the wedding! Totally team LC… love her! and that pasta looks amazing. we eat zoodles alllll the time but I miss real noodles :( might be splurging on this soon! Odd Mom Out is THE BEST! I am totally obsessed with it! I haven't had zoodles but I LOVE me some regular pasta. One day I will get around to making shrimp at home... it just terrifies me! Ohh pasta! There is nothing like it! I love Lauren Conrad, she is so stylish and classy! Have a fabulous weekend! I need to look into Odd Mom Out for sure. And I lvoe that shirt dress! The pasta looks so good!! Your shrimp recipe looks good too!!!! And I love that dress you posted. Now can we talk about how bad I just want to be LC?????? And that closet????? Her entire place is absolutely amazing. Have a great weekend!! What a great post sweetie, it is so inspiring to start the weekend! I will def try that recipe! I was going through your older posts and I love your blog! Love your picks! And that floral dress is too cute! I definitely must watch Odd Mom Out! It looks so funny! That spaghetti dish is calling my name! I love zoodles but the real deal is sooo good! Hope you have a great weekend Biana! I saw Drew Barrymore promoting that show because apparently that's her sister in law in it... & I missed it - dang it - I need to see when they replay it. Have a great time at the wedding hun! And stop it with the delish recipes! Oh my word I'm craving shrimp and pasta at 9:00 in the morning! And Lauren's home. Oh my word. I die. I can't wait to watch that show, Bravo is the best! And I just backstalked Lauren and looked also at their engagement and wedding photos, beautiful couple! Love the shirt dress! I am craving my old fave bang bang shrimp pasta and it's really not the same with spaghetti squash! It's just not... treat yo-self!!! Woohoo I love wedding season even as exhausting as they are, so fun to see a couple in love getting married :)! I'll have to check out that show, looks good! love all of your favorites!!! especially odd mom out :) I can't stop with the floral maxi's lately - I want floral everything. Have a great weekend! I'm always in a pasta sort of mood! Lol enjoy the wedding. That floral shirt-dress is seriously SO pretty! AH, I want it!! Also want to check out that show. Anddd i'm off to click on all of those links at the end now too- haha! Enjoy the wedding & your weekend! It definitely is wedding season! That recipe looks amazing! I love the floral print - it seems to be what I'm drawn to lately! I wish I had a wedding to go to this summer! :) I love that dress as well! Have a wonderful weekend! I love weddings too-I have so many this year (lots of plane tickets back & forth, but it's worth it!). I need to make that pasta-pasta with shrimp is my favorite! Also, that shirt-dress would look amazing on you! :) Have a great weekend! That pasta dish looks so insanely good! Sigh. And organizational tips?? Speaking my love language. Going to check it out right now. Have an awesome weekend! I knew Odd Mom Out was going to be good and so far it's fabulous. Love it! Happy weekend, gorgeous! I LOVE ODD MOM OUT! I didn't have super high expectations and was blown away. It was hysterical and not in the super typical stereotype way you would've expected. Von Weber. Great round up! That pasta looks so yummy and I love love that dress! so cute! I need pasta soon too. It's been too long! I've been craving pasta a lot recently too - which is so weird since it's way too hot out for that! Shirt dresses are a new favorite of mine too - so great for cooler nights too! Ive heard about Odd mom out and never watched it. I might just have to!! I craved pasta today and caved. That recipe sure does look yummy! I LOVE any shrimp and pasta combo! That Caribbean one looks amazing :) I hope you have a great weekend! I love pasta, like too much probably! haha You can make it so many ways! Hooray for another wedding weekend! :) Im loving that floral shirt dress, and I can't wait to check out some of those links - I'm sure Lauren Conrads house is flawless. Have a good one, friend! The 'Odd Mom Out' commericals had me hooked, I didn't realize it's on though so I'll have ot get caught up! Also loving that floral dress, can you stop finding amazing things that I have to have? Thanks. Happy Friday! Love these links! Def going to get me through the weekend and catching up on all my reading ;) Btw, those roses are GORG!!! Have fun at the wedding today- and I'll definitely be checking out that veil article, I'm still torn between cathedral and fingertip! Love these round ups Biana! I'll definitely have to check out that show on Bravo! Have fun at the wedding! Odd Mom Out is hilarious!! I was cracking up! Ahhh that pasta! I'm not much of a cook, but I definitely am going to try that. That shirt dress is sooooo pretty!! i've been looking for a new show, i'll have to check that one out! that shirt dress is gorgeous and i'm totally drooling over that pasta!